You should make a cat that has lymphoma as comfortable as possible. Feline lymphoma or lymphosarcoma is the most common form of cancer in cats. It's highly treatable but incurable; eventually the disease will be fatal. 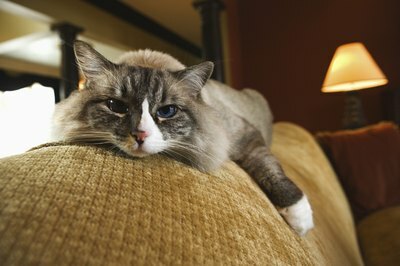 When your cat has this disease, it's important to recognize and understand the end stages, and to know what choices to make for your cat's sake. At the end stage of lymphoma, the cancer invades organs and bones -- any place where the lymphatic system connects. Symptoms include vomiting, diarrhea, weakness and lack of appetite or refusal to eat. Other symptoms are common depending on where the cancer invades. For example, if lymphoma occurs in the kidneys, it will cause increased thirst and urination. Other symptoms can include cough, difficulty breathing, weight loss, constipation, bloody or tarry stools and swelling around the jaw. Because lymphoma isn't curable, treatment is aimed at putting the cancer in remission. You'll consult a veterinary oncologist for chemotherapy and radiation therapy. Once you've obtained remission, you'll watch for signs of the cancer returning. Subsequent treatments can put the cancer in remission again, but the remission time will be shorter. Eventually, you will find that the remission period has become too short to continue treatment or that the cancer has developed resistance to the drugs available. At this stage, it's just as important as before to monitor your cat's comfort levels, eating and drinking habits, and general well-being. Your veterinarian may prescribe pain medications to increase your cat's comfort or maybe a special diet to entice your cat to eat. The prognosis for lymphoma depends on what stage the cancer is discovered, what treatments are performed, the age and health of the cat, and the amount of time of remission. Cats who are treated for lymphoma can get almost two years of life, much of it with little or no pain. If you do nothing, or if the treatments no longer work in end-stage lymphoma, the average life expectancy is about six weeks. Palliative care is very important as it often helps prolong a cat's quality of life. Treating the symptoms as they arise, such as weight loss, lack of condition, lack of appetite and pain, can greatly extend your kitty's quality of life. Cancer often robs muscle mass from animals due to malnutrition, and many cats are unwilling to eat when they do not feel well. Your veterinarian can prescribe a diet that's palatable to your cat or provide medications to increase the cat's appetite. Pain management is important for your cat's quality of life during end-stage lymphoma. Your veterinarian or veterinary oncologist may prescribe pain medications for your cat. In some instances, prednisone and palliative radiation may help mitigate pain.